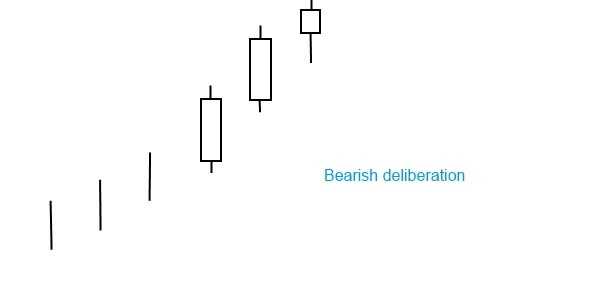 The bearish deliberation pattern is formed by two long white candlesticks that are followed by a small white candle. The market is in an uptrend. The second day has a higher close than the first day. On the third day typically a short white candle, a spinning top or a doji forms. This candle may open at or near the previous day’s close or it may gap up. The small third body is a sign of indecision over the prevailing uptrend. Just like the advance block pattern, the bearish deliberation also represents buyers’ weakness. The key difference is that all of the weakness shows up on the 3rd day. This pattern signals a potential trend reversal and has a moderate reliability.